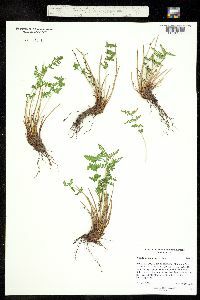 Stems compact, erect to ascending, with few to many persistent petiole bases of unequal lengths; scales uniformly brown or bicolored with dark central stripe and pale brown margins, ovate to narrowly lanceolate. 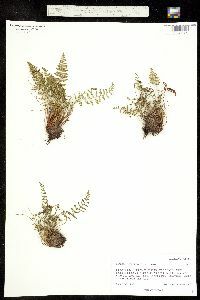 Leaves 9--35 × 1--8 cm. Petiole usually reddish brown to dark purple proximally when mature, not articulate above base, relatively brittle and easily shattered. 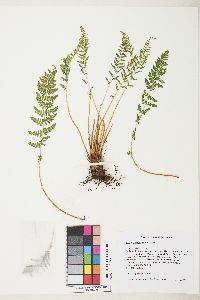 Blade lanceolate to linear-lanceolate, 2-pinnate proximally, moderately glandular, rarely somewhat viscid; most glandular hairs with thick stalks and distinctly bulbous tips; rachis usually with abundant glandular and nonglandular hairs. Pinnae lanceolate-deltate to ovate, longer than wide, abruptly tapered to a rounded or broadly acute apex, occasionally attenuate; largest pinnae with 5--14 pairs of pinnules; abaxial and adaxial surfaces glandular and sparsely villous, with flattened, multicellular hairs concentrated along midribs. 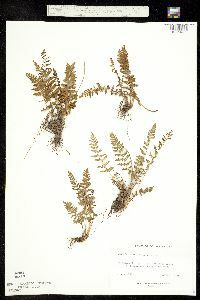 Pinnules dentate, often shallowly lobed; margins nonlustrous, thin, slightly glandular and occasionally ciliate with isolated, multicellular hairs, lacking translucent projections. Vein tips slightly (if at all) enlarged, barely visible adaxially. Indusia of filamentous or nonfilamentous segments, these multiseriate proximally, often uniseriate distally, composed of ± isodiametric cells, concealed by or slightly surpassing mature sporangia. Spores averaging 39--57 µm. 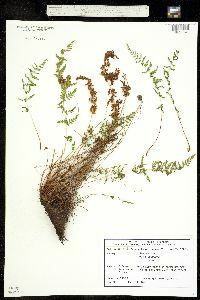 Woodsia scopulina shows substantial variation in leaf size, shape, and dissection, and in the abundance of multicellular hairs on the pinnae. Although much of this variation seems to be environmentally induced, recent studies (M. D. Windham 1993) have identified three chromosomal/morphologic variants that are treated here as subspecies. Diploid populations of W . scopulina are divisible into two groups, one of which (subsp. 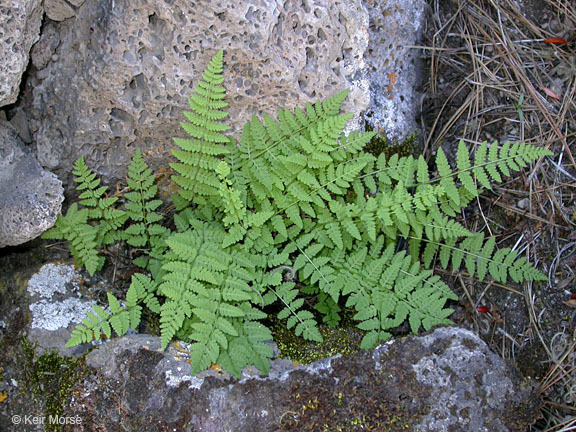 scopulina ) is scattered throughout the mountainous regions of western North America while the other (subsp. appalachiana ) is confined to montane habitats in the southeastern United States. These taxa seem amply distinct (T. M. C. Taylor 1947) and might be considered separate species if not for the existence of populations in the Great Lakes region and western cordillera that tend to bridge the morphologic and geographic gap between them. These intermediate populations (subsp. laurentiana ) appear to be uniformly tetraploid and may have arisen through ancient hybridization between subsp. 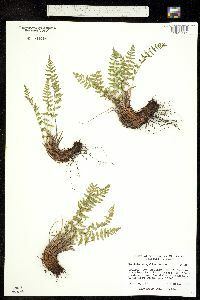 scopulina and subsp. appalachiana . 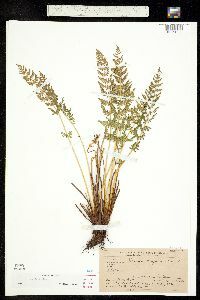 In regions where subsp. 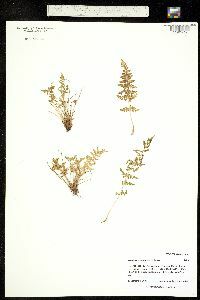 laurentiana is sympatric with subsp. 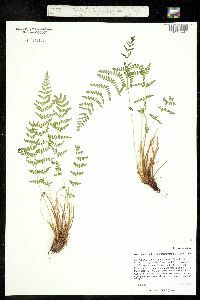 scopulina , the two taxa are rarely found growing together, suggesting that they differ in their ecological tolerances and/or habitat requirements. Rhizome-scales lanceolate, 4-5 mm, hair-pointed, subdenticulate, sparsely ciliate, with an irregular black midstripe; lvs 18-40 cm, evidently stipitate-glandular (the glands clavate) and sparsely to copiously beset with ±elongate, flattened, septate white hairs at least on the rachis and the lower surface of the blade; petiole brown, hairy, scaly only at the base, not articulate; blade lance-linear, 3-7 cm wide, acute, slightly narrowed below, bipinnate, the rachis not scaly; pinnae 9-25 pairs, deltoid-ovate to lanceolate, acuminate, sessile, scaleless, the pinnules 7-10 pairs, oblong, obtuse, crenate to subpinnatifid; indusial segments 3-6, incurved, several cells wide at least below, deeply lacerate; 2n=76. Cliffs and rocky slopes; cordilleran region from Alta. and s. Alas. to Calif. and N.M., e. irregularly to Que. ; isolated in the Ozark Mts. and in the s. Appalachian Mts. from Va. and W.Va. to N.C. and Tenn. (W. appalachiana, the Appalachian and Ozarkian plants) W. حaxonii R. M. Tryon is a triploid sterile hybrid with tetraploid W. oregana.